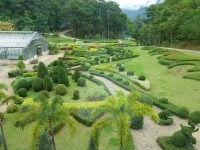 A beautiful Chiang Mai attraction, the first genuine botanical garden in Thailand was the Queen Sirikit Botanic Garden in the Mae Sa Valley. It now also serves as a centre of botanical research and studies. The main feature of this attraction is the Glasshouse Complex, made up of four exhibition conservatories and eight display glasshouses. A lovely river runs melodically through the grounds. The Thai Orchid Nursery and Rock Garden are other highlights of the gardens, as well as various walking trails and shaded rest areas. Facilities for visitors include a restaurant, a first-aid station, souvenir shops and toilets.